LKQ CEO Nick Zarcone suggested last month that State Farm might ramp up its usage of aftermarket parts following its $250 million settlement of a lawsuit tied to a notable $1.05 billion parts case. The U.S. Southern District of Illinois in September granted preliminary approval to a $250 million settlement agreement for what might be as many as 4.7 million people in a class that had alleged State Farm conspired to elect a sympathetic judge and concealed those efforts from the Illinois Supreme Court. The class-action Hale et al v. State Farm et al litigation involved everyone who twice won the Avery et al v. State Farm $1.05 billion lawsuit for State Farm’s use of non-OEM collision repair parts but who subsequently lost an Illinois Supreme Court decision following the election of allegedly State Farm-backed Judge Lloyd Karmeier. Karmeier did not recuse himself from the decision. The new Hale lawsuit had initially sought new damages of $7.6 billion for the entire class. (State Farm and the other defendants disagree with that amount.) Ironically, the $250 million Sept. 4 settlement announcement came the same day as State Farm announced it had bought 18 years of naming rights to the Arizona Cardinals’ stadium. Zarcone said the settlement needed to be finalized by a court. U.S. Southern District of Illinois Judge David Herndon will hold a “final fairness hearing” on the settlement at 9 a.m. Dec. 13. Class members can file objections until Nov. 17. 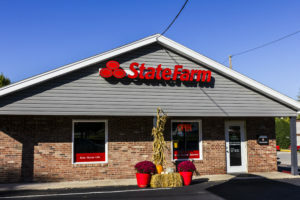 “To our knowledge, State Farm has not made any public statement regarding its intention to reinstate the use of aftermarket parts,” Zarcone said last month. He said LKQ keeps meeting with State Farm — the nation’s No. 1 auto insurer — regularly and it would tell analysts if there’s any material information on this front. “We view this as a positive,” he said. LKQ’s North American aftermarket parts segment is about a $3.5 billion business already, Zarcone estimated. Months before the settlement, a May memorandum provided by a Select Service source indicated State Farm had agreed to allow new classes of certified aftermarket parts on customers’ vehicles. Only Certified Automotive Parts Association and NSF certifications would count for these purposes, according to the memo. However, at least three of the new additions conflicted with other bans remaining in the memo. The document said State Farm still forbids most “Bumper components” and “Outer sheet metal and plastic / composite parts” and many “Lighting components” from being anything other than OEM. A month before the memo, State Farm announced the first of a series of rate cuts for more than 30 states. The reports come following premium cuts in numerous states by State Farm, raising the question of if the carrier is attempting to offset the decreased revenue with denials on the claims side — regardless of what OEM procedures dictate or what at least one State Farm executive has learned from automakers.